Durian (Durio zibethinus) is the fruit of several tree species belonging to the genus Durio. The edible flesh emits a characteristic pungent odor that is strong enough to penetrate the husk is intact when intact. Durian (Durio zibethinus) is the fruit of several tree species belonging to the genus Durio. The edible flesh emits a characteristic pungent odor that is strong enough to penetrate the husk is intact when intact. Some people regard the durian as having a pleasantly sweet fragrance while others find the aroma overpowering and repulsive. Here are the 7 health benefits of durian. 1. Durian helps support your digestive system. Durian possesses a considerable amount of fiber. Fiber stimulates peristaltic motion and increased secretion of gastric juices, which eases digestion, prevents conditions like constipation, and protects the body from more serious conditions like colorectal cancer. One cup of durian contains 9 grams of dietary fiber. 2. Durian has a lower glycemic index score than many foods. The glycemic index ranks food and drinks based on their blood sugar increase potential. Foods high on the glycemic index like white rice and white bread will break down easily and cause blood sugar and insulin level spikes after meals, which is followed by rapidly dropping blood sugar levels. Durian is more slowly absorbed into the bloodstream, which prevents sugar crashes, sugar cravings, and mood swings. 3. Durian can help maintain a healthy blood pressure. Durian is loaded with potassium and a low content of sodium, decreasing the risk of hypertension. They are well known because of its high potassium content. One durian contains a whopping 1,060 milligrams of potassium, compared to just 4.9 milligrams of sodium. This helps the blood vessels relax and maintains proper blood pressure. 4. 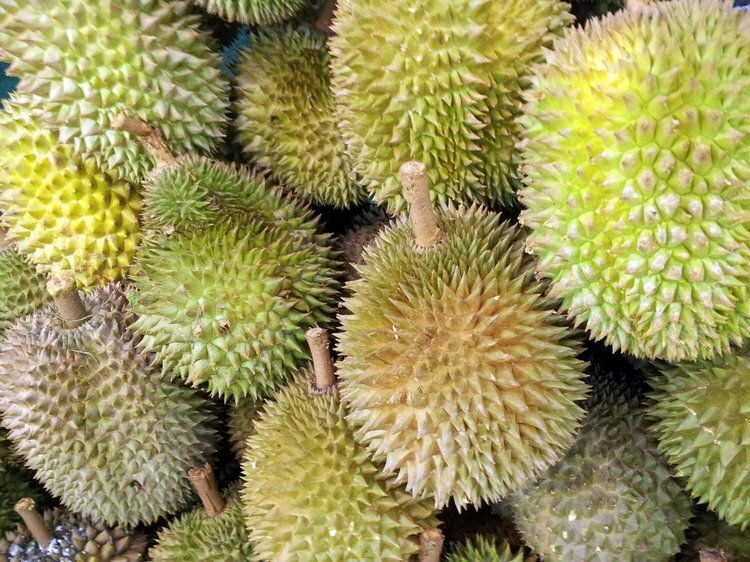 Durian can help individuals fight infections. One cup of durian contains 80 percent of the vitamin C daily requirements per cup. Vitamin C is a potent natural water-soluble antioxidant that helps the body develop resistance against infectious agents and eliminates cancer-causing free radicals in the body. 5. Durian can contribute to improving the heart’s health. 6. Durian can assist in the antioxidant defense. One cup of durian contains 39 percent of the mineral manganese, which is an essential cofactor in some enzymes important in antioxidant defenses. For example, some enzymes disarm free radicals produced within the mitochondria, which require manganese. 7. Durian may help prevent cognitive decline. Several components of durian, such as potassium, folate, and various antioxidants are known to provide neurological benefits. Folate has been known to reduce the occurrence of Alzheimer’s disease and cognitive decline. Potassium has been linked to increase blood flow to the brain and enhance cognition, concentration, and neural activity. Also, durian contains a considerable amount of vitamin B6. A deficiency has shown depression and nausea. Be sure not to consume too much. The vitamin B6 upper limit is set to 100 milligrams for adults over the age of 18, but adults do not need that much unless directed by the doctor. Canoy, D., Cairns, B. J., Balkwill, A., Wright, F. L., Khalil, A., Beral, V., ... & Million Women Study Collaborators. (2016). Hypertension in pregnancy and risk of coronary heart disease and stroke: A prospective study in a large UK cohort. International journal of cardiology, 222, 1012-1018. Peters, S. A., Singhateh, Y., Mackay, D., Huxley, R. R., & Woodward, M. (2016). Total cholesterol as a risk factor for coronary heart disease and stroke in women compared with men: a systematic review and meta-analysis. Atherosclerosis, 248, 123-131. Ekmekcioglu, C., Elmadfa, I., Meyer, A. L., & Moeslinger, T. (2016). The role of dietary potassium in hypertension and diabetes. Journal of physiology and biochemistry, 72(1), 93-106. Rimm, E. B., Willett, W. C., Hu, F. B., Sampson, L., Colditz, G. A., Manson, J. E., ... & Stampfer, M. J. (1998). Folate and vitamin B6 from diet and supplements in relation to risk of coronary heart disease among women. Jama, 279(5), 359-364. Coassin, M., Ursini, F., & Bindoli, A. (1992). Antioxidant effect of manganese. Archives of biochemistry and biophysics, 299(2), 330-333.